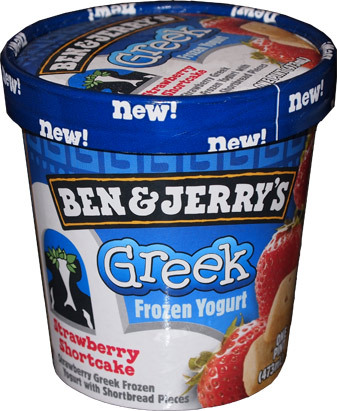 No no no, I haven't gone nuts and suddenly fallen in love with the new Ben & Jerry's line of Greek Froyo. What I have done is used my wife's enjoyment of the Vanilla Blueberry Graham as an excuse to pick up this pint, take a few sample bites, and then move on with my life. 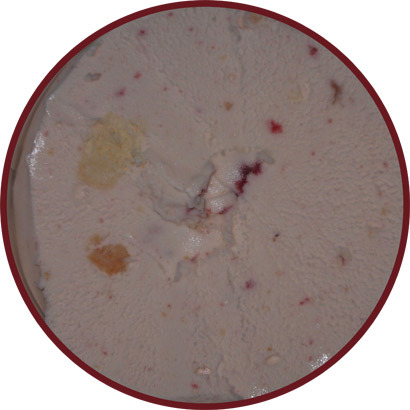 It's a simple combination of Strawberry Greek Froyo and shortbread pieces. In a non-tangy form, I would probably love this stuff. So, here's a close up and despite my dislike of the other two greek froyos, I find this one the least offensive of the new line. The quality strawberry flavor is doing a half-way decent job of covering up that yogurt tang that I despise. In fact, I was almost tempted to eat more than a few tiny scoops... but then I decided that a real breakfast would probably make a better choice to start my day. On Second Scoop: Oh man.... we have a problem. I think I -almost- like this one. I took the above pictures this morning and for whatever reason, the urge struck me to have a few more bites after dinner. Well a serving later and I was actually tempted to keep going. No, it's not awesome, but I can convince myself that this one ain't half-bad. If this particular pint was rocking some larger and more frequent strawberry bits, I might even consider buying it again. Better yet, if the tang of the yogurt could be encircled by a stronger strawberry flavor and mixed with a few more shortcake bites, it would actually be a fun flavor for me -- I think this is about as close to a positive review as you are going to get from me on this product line, but hey, at least I have a favorite now. Yeah like maybe some oatmeal flavors in ice cream form. More maple, cinnamon and brown sugar ice creams would be cool. I have a feeling that the new turkey hill pretzel one would make an awesome breakfast aha. I did a review about some of the greek froyo flavors in my blog as well (http://benandjerrysfanatic.blogspot.com/). I like their ice cream better than the froyo but I think that it is great the B&J's is expanding their market. I would like to see what else they come up with.